Hello friends! We are officially on Baby Awesome Watch of 2014 over here in Austin-land. I have been experiencing definite signs of early labor since last week, including contractions that built up enough to make us think we were headed to the hospital at two different times- last Monday the 19th, and yesterday, Friday the 30th. But then the contractions just stopped altogether. Today I’ve had more contractions, but we’re waiting to see if they get consistent and more intense. I’ve been 1 cm dilated and 90% effaced since the 19th, and I’ve found myself gaining an education in what false labor is all about. Turns out there are just some women that take a long time to move into the active phase of labor that leads to the baby being born. I’ve been reading birth stories having to do with long, early labor and prodromal labor. Prodromal labor is synonymous with false labor, but it makes me feel more official and reminds me that this whole thing is a process. The daily pain and discomfort I’ve been feeling have been anything but false, so I’m thankful to know I’m not alone. Grace at Camp Patton is my new favorite mommy blogger, and her experience with her fourth baby is very similar to what we’ve been going through if you like reading things like that. Baby Awesome is still doing great (lots of movement and a strong heartbeat), although her mama is going a little crazy wondering when she’ll arrive. We haven’t been too concerned with moving the process along, either with medical or home remedies, because I’m just two days over 39 weeks. We’re choosing to trust that she’ll come when she’s ready, and my body is just doing its thing. For now, I’m resting, drinking lots of water, and trying to stay cool. My hormones must have really shifted into high gear in the last three weeks because I spend much of my time feeling like I’m living on the surface of the sun. Fun times. Actually, the discomfort of these last few weeks has really helped prepare me for bringing our little girl into the world. Mid-pregnancy I was feeling afraid of labor and delivery. But as I began to get bigger and more and more uncomfortable, I realized that I was becoming willing to do whatever was necessary to go from being pregnant to being a mommy holding her baby. It has reminded me of other times in my life when God has used a season of discontentment and feeling uncomfortable to make me willing to change and do something hard in order to get me to the new circumstances he has in mind. I’m thankful that God has brought me to a good place as I get ready to become a mom. Pray for Trav and I as we wait for our daughter to arrive! The mental and emotional game is such a big part of this whole thing. We are SO excited to meet Baby Awesome. And to introduce her to all of you! =D Thanks for being excited with us. 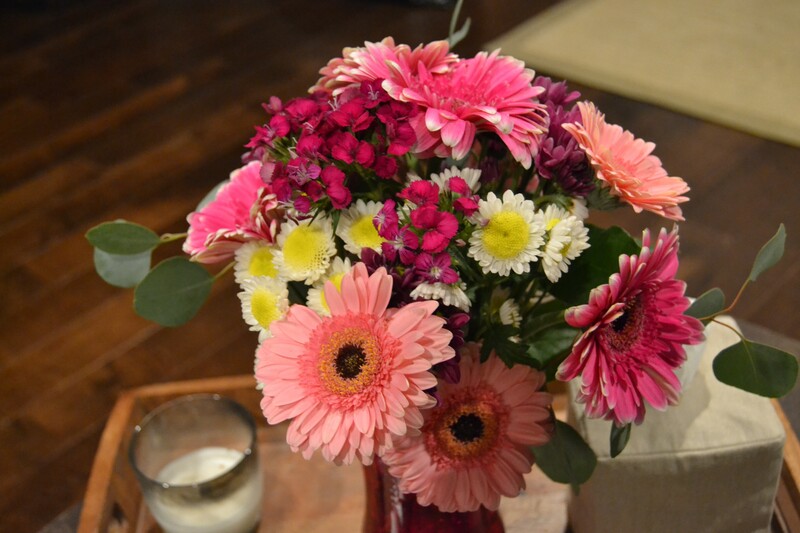 I came down with a cold on Tuesday, and Trav brought these home to cheer me up. He’s a smart man. I feel for you, Laura. A cold in the midst of everything is not what you want, but I’m praying it passes quickly–and builds up your immune system in the process. Meanwhile, you’re in my thoughts and prayers during this waiting stage. It’s a painful but important learning period, as you have already discovered. You’re learning to redefine what makes for a “good day.” Love you! P.S. Travis is smart and compassionate, AND he has good taste. The flowers are beautiful.